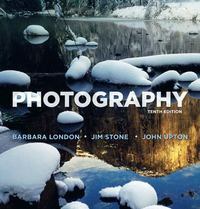 Photography 10 Edition For introductory and advanced courses in Photography. The London, Upton, Stone series has helped over 1,000,000 photography students capture their potential. And Photography, 10e is the most comprehensive, up-to-date resource for today's photography students. No other text teaches students the skills they need to use the medium confidently and effectively, while emphasizing both technique, visual awareness, and the latest technologies. This is the text that students will want to keep for years to come.